You probably know by now that when you host a Stampin' Up party, you can earn all sorts of free goodies as well as exclusive stamp sets that aren't available to buy. Have I mentioned how fabulous the hostess sets are this year? 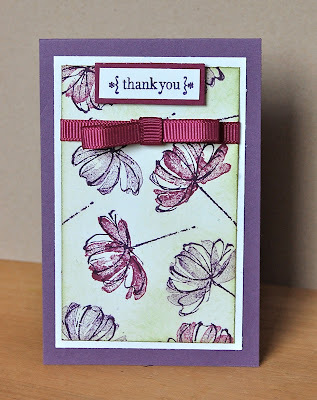 They are amazing - and I've used one of my favourites to make today's thank you cards. The colour inspiration was taken directly from page 59 of the current Idea Book and Catalogue - which is absolutely packed with gorgeous samples and inspiration. If you don't already have one, why not order one from me for the special price of £4 including p&p (see right bar for details). Both cards are a non-standard size as I didn't need an envelope with them. This is a two-step stamping set and in both cases I stamped the line image in Elegant Eggplant and overstamped with Rich Razzleberry and Perfect Plum. Looks like I'm getting into these purple shades! 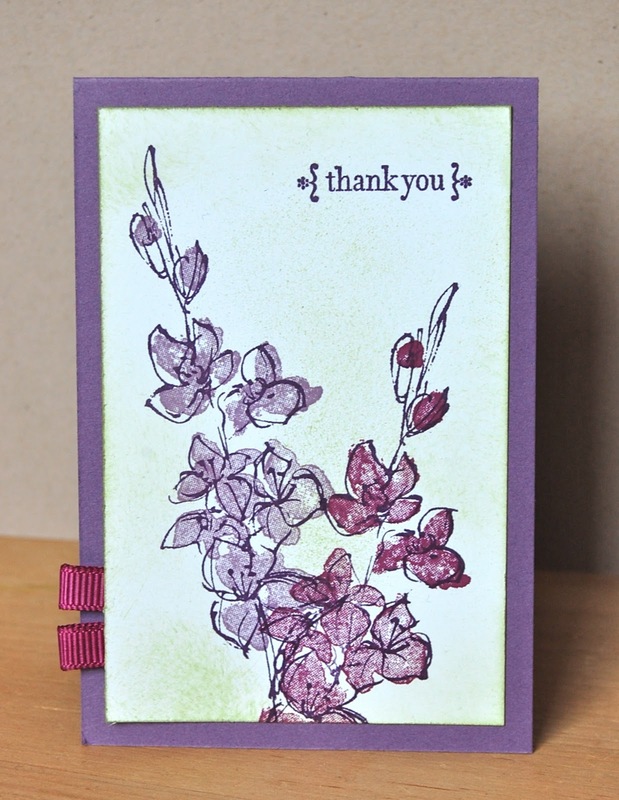 Cut a piece of Elegant Eggplant card stock 7cm x 21cm, score and fold in half to make a card base. Stamp a design on Whisper White card stock cut 6.5cm wide x 10cm high. Sponge lightly around the design with Certainly Celery ink. Embellish with Rich Razzleberry 1/4" grosgrain ribbon before attaching to the card front. If you live in the UK you may have noticed how dark it's getting. In less than a week it will be November and from there it will be a matter of weeks until Christmas... But don't panic! Join me tomorrow for Three Minute Thursday, when I'll be showing you another of my Christmas cards-in-minutes. and it is purple again :) they look very elegant, Vicky!